The Mississippi River will rise during the drenching rains that follow immediately after a pole shift, the ocean waters evaporated into the air during the worldwide hurricane that occurs during each pole shift condensing out of the air in a fury. Rivers that feed into the main rivers emptying a continent will be affected by several factors that will cause flooding beyond what those living along their banks suppose could ever happen. Flooding today is a comparatively local affair, in the US affecting several states at most. Where one river swells, another is not so affected, and thus the drainage happens more rapidly than it would if all the rivers were swollen. During the pole shift, there will be torrential rains everywhere, on and off, as the clouds are dropping water whipped up from the oceans. The Mississippi will drain a wide area experiencing torrential rainstorms, and will put any bordering land at risk of flood surges, no matter how high the hill. Large amounts of water may pass though, at great speed, and when encountering an obstruction such as a hill, rise up as the path of least resistance. These flood surges will not be gentle, so escape in a boat, which would capsize and tumble in the roistrous waves, is not likely. The horrific backwash caused by a Mississippi unable to empty into the sloshing Gulf will reach as far inland as Missouri and Kentucky, increasing the flooding along the rivers that drain into the Mississippi. 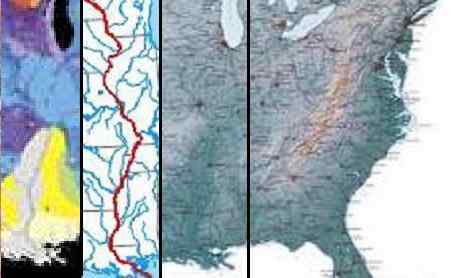 Low lying states along the Gulf such as Mississippi and Louisiana, which border the Mississippi where it drains into the Gulf, can expect to be under water. As can be seen by an analysis of the rock strata to the east and west of the Mississippi, the Mississippi is following the curve of solid rock just to the east. The potential for a greatly widened Mississippi occurs south of the Illinois border. To the south of this point the sea level elevation is lower and the rock strata is of a different nature than that above or to the east of this point. This is where the Mississippi will spread, to the west between the Illinois border and the Mississippi delta. We estimate the Mississippi will widen by 50 miles, give or take depending on its meandering and the stability of the rock or soil in any given location. Lowlands in Bolivar and Washington counties of Mississippi state are also vunerable to this flooding. Note New Madrid Sequence commentary.